Bungie explains that, contrary to what last weekend's glitch video implied, Destiny's DLC expansions still need work. Over the weekend, an unexpected glitch revealed that Destiny already contained in-game level listings for upcoming DLC content. For some, this raised the question of whether Destiny carried disc-locked DLC, a feature which certainly isn't unheard of these days. Bungie has now officially commented on its forums, explaining that while placeholder notes exist in the Director, neither expansion pack is in a finished state. "We noticed that you noticed that we already have plans for upcoming content packs in Destiny," the forum post reads. "We do! They have activity names (which may or may not change) and we have a really good idea what they're going to contain. They even have placeholder nodes in the Director, as you've already discovered. But neither of the Expansion Packs we've announced are finished. "People at Bungie are hard at work to complete content for our first post launch pack, 'The Dark Below', as I type these words," the post continues. "It will be finished soon. It releases in December. Soon, we'll detail it out for you so you can see exactly what we've been working on." Level descriptions exposed in the glitch partially reveal what players can expect, including story missions addressing the Hive and upcoming Crucible rewards. 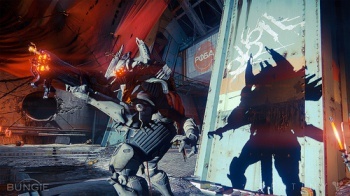 Officially, Bungie revealed that "The Dark Below" would deal with a tomb and ancient dark god under the Moon's surface, but otherwise kept largely quiet. Since December isn't that far away, more information should surface very soon.